CHICAGO, IL and WASHINGTON, DC--(Marketwire - December 2, 2008) - Companies in certain consumer goods sectors that do not implement sustainable environmental strategies could face a potential reduction of 13 percent to 31 percent in earnings by 2013 and 19 percent to 47 percent in earnings in 2018. These findings are the result of a "future scenario" analysis released today by the World Resources Institute and A.T. Kearney, Inc. It is titled Rattling Supply Chains: The Effect of Environmental Trends on Input Costs to the Fast Moving Consumer Goods Industry, and is the first report of its kind to calculate the financial impact of environmental issues facing this industry. The analysis provides consumer packaged goods executives with a tool to assess how environmental legislation and climate change could impact their businesses in future years. It also outlines how these executives can begin to develop strategies to address these issues. Although the current financial crisis has resulted in declining commodity prices, the authors find that environmental pressures will continue to impact the supply and price of key commodities in the long term. The crisis should be viewed as an opportunity to address these challenges through transformational change and not as a time to ignore them. "The Ecoflation scenario is a vision of a future where companies have to deal with environmental costs previously borne by society," said Andrew Aulisi, director of WRI's Markets and Enterprise Program. "Environmental concerns are driving a global trend of policy activism and regulation. 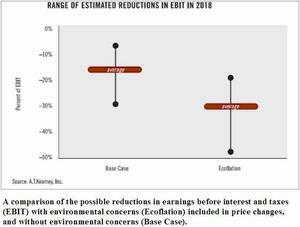 Our scenario describes this trend and the most pressing environmental challenges, and finds that the earnings of consumer goods companies are exposed to significant risk rising out of their supply chains." For their research, WRI and A.T. Kearney based the "ecoflation" scenario on major environmental trends and policy developments, such as U.S. and international climate change regulations, enhanced forest policies, growing water scarcity, and new biofuel policies. They then analyzed how these drivers might affect prices on selected commodities like oil, natural gas, electricity, cereals and grains, soy, sugar, palm oil, and timber. The results offer tangible illustrations of how environmental costs might impact the value chain, especially for fast-moving consumer goods that are usually produced in large quantities, such as food and beverages or household products. Cereal prices, for example, are shown to have upward pressure from climate change policy and growing water scarcity, but may be reduced if certain biofuel policy changes reduce ethanol demand. The report finds a 6 to 13 percent increase in cereal commodity prices due to these pressures. "The results highlight the need for strategic scenario-based planning," according to Daniel Mahler, A.T. Kearney partner. "Winning companies will anticipate this changing landscape. These companies will collaborate with suppliers and other stakeholders, and make environmental sustainability a key business principal." possible, seek substitutes with lower environmental impacts. and an upgrade of sustainability standards for the supply base. For a copy of the full study, please go to www.atkearney.com. The World Resources Institute (www.wri.org) is an independent, non-partisan and nonprofit organization with a staff of more than 100 scientists, economists, policy experts, business analysts, statistical analysts, mapmakers, and communicators developing and promoting policies that will help protect the Earth and improve people's lives. A.T. Kearney (www.atkearney.com) is a global strategic management consulting firm known for helping clients gain lasting results through a unique combination of strategic insight and collaborative working style. The firm was established in 1926 to provide management advice concerning issues on the CEO's agenda. Today, we serve the largest global clients in all major industries. A.T. Kearney's offices are located in major business centers in 34 countries. Over the summer of 2008, when this report was being prepared, the price of oil peaked at over $145 a barrel. As we write this in late November, a scant four months later, oil is down to around $51 a barrel. Since our study is an attempt to determine the effects of future rises in commodity and energy prices due to both physical and policy-driven constraints, it is important to note that, whatever the condition of the global financial system, the fundamental issues governing commodity availability, and hence price, remain unchanged. Population growth and its concomitant effects on demand for goods, energy, and land remain unabated. Climate change continues unchecked. A growing water shortage looms. Governments will have to respond to these threats, and those responses will have an impact on manufacturers. Whatever the price of oil, it is important to remember that the environmental forces are real, that governments will respond, and that there will be an impact across the value chain, and that businesses that start planning now for those impacts will be in a far better position than those that don't. Because of the temptation to focus on short-term price swings, the current financial crisis makes this report all the more relevant.